~Willow attained her AKC Trick Novice title today, what a good girl! UKC Best-In-Show and High-In-Trial Champion Sunstar Willow of OwyheeStar, AKC Canine Good Citizen, AKC Trick Novice, UKC Rally Obedience I, Therapy Dog International certified! The processing fee for each title is $20. Multiple titles for the same dog can be sent in together, each one will be processed in succession after each previous title has been added and printed. I n this title, handlers perform a short routine with at least 10 tricks previously learned. 1) Perform the tricks (from the check list in the Title Application) in the presence of an AKC Approved CGC Evaluator. The Title Application will need to accompany the check list for the particular title you are applying for. 2) AKC will recognize Do More With Your Dog!™(DMWYD) titles at Novice, Intermediate and Advanced levels. The Title Application will need to accompany proof of the DMWYD title being earned, such as a copy of the actual title. If you have a DMWYD title that is above Novice, (i.e. Intermediate, Advanced, Expert) until December 31, 2017, you may send proof of the title (copy of DMWYD certificate) and pay only the $20 title fee for the highest level title for which you are applying to earn the equivalent AKC Trick Dog title. If you have a DMWYD Intermediate certificate, send the AKC Intermediate Trick Dog application with the $20 title fee and AKC will issue your AKC Intermediate Trick Dog title. If you have a DMWYD Advanced Trick Dog title, send the AKC Advanced Trick Dog Application with the $20 title fee and AKC will issue your AKC Advanced Trick Dog title. If you would like to earn the AKC Trick Dog Performer title, send a copy of your DMWYD Expert Trick Dog or Champion Trick Dog certificate, along with the $20 title fee, the AKC Trick Dog Application for the Performer level, and, YOU MUST INCLUDE A VIDEO. For more information about the Trick Dog Program check out our Frequently Asked Questions. Got a new pop-up and chairs today- Willow, Juniper, Daisy and I are looking forward to the upcoming UKC dog shows in Tigard, Oregon! Willow is entered in Altered Champion and Juniper is entered in Novice Puppy, we can’t wait! Shiny’s first dog show, first rally course & first leg!!! The Roaring Fork Kennel Club (AKC) sponsored event will see the lovely Shiny for a second time. Yesterday, he completed his leg toward getting his Rally Title. What an awesome achievement! Today, they are back to see what else they can accomplish. Yes–Shiny is a Blue Longhair Weimaraner! Shiny is a true Colorado Boy! Here he is on his first “fourteener” (mountain over 14,000 feet) just 2 weeks before his first birthday! He also was the demo dog for the local 4H conference today. As you can imagine, he was a big hit! The elegant Weimaraner is considered eye-candy by those loving the large sporting breed. For many, nothing other than this breed will do; however, others find their quirks and temperament challenging. The Weimaraner Club of America (WCA) Breed Standard is is listed as follows by the American Kennel Club (AKC). OwyheeStar Note: The Breed Standard is copied from the Weimaraner Club of America (WCA) Website. The photo (of Willow and Jan Magnuston is compliments of Jan Magnuson SUNSTAR All-breed Dog Training. The girls have been growing up and changing like crazy over the last 6 months. Skye will be 2 years old on May 31, and Haze will be 2 years old on July 31. Both girls regularly attend classes at our dog club. We usually have them enrolled in at least 2 different types of classes each week. The current term classes are Agility Foundation and Advanced Rally. Skye also is involved in the newer sport of Nose Work. Nancy is hoping to gear Haze towards shed hunting which she will work with Haze on her own. We take the dogs most everywhere with us, although we do make sure they are left at home periodically so that they learn it’s ok to not be with us all the time. When in the house alone, the girls are crated if no one will be there for more than an hour. So far, they have shown no real signs of separation anxiety, although for the first few minutes when we leave, they anxiously hope they get to go by watching out the window. If not, they eventually go lay down staying quiet until we return. We are still constantly working on good manners for greeting new people and other dogs as they get so excited. The girls definitely keep us on our toes, but we can’t imagine life without them. They are so funny and interactive. They love to get dressed up and are curious about everything, which makes for great adventures. Skye still feels that she controls all things at all times, although as she has become older, her need to control all things shift usually ends by 8 pm, as she disappears and going to bed on her own. 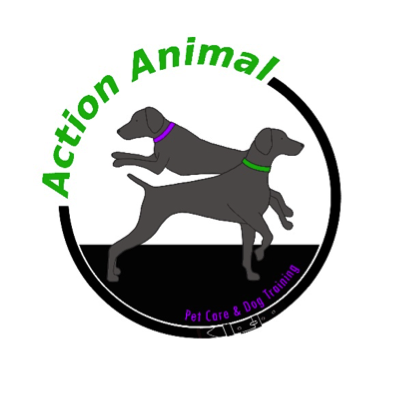 The girls have also been the inspiration for our new logo for our business Action Animal Pet Care & Dog Training.